V‑Vocal is a vocal processor that integrates Roland’s VariPhrase technology into Cakewalk. Designed for monophonic sounds, especially vocals, V‑Vocal does pitch correction on notes and phrases, edits formants, adds vibrato if you want, and can also correct timing. The following procedures explain how to manage V‑Vocal Region FX clips. For information about using V‑Vocal, see V-Vocal Editor. Select the audio data you want to use. Use the Track view Region FX > V‑Vocal > Create Region FX command, or right-click the clip and choose Region FX > V‑Vocal > Create Region FX from the Clips pane pop-up menu. The selected audio region is converted to a V-Vocal Region FX clip, and the V-Vocal editor appears in the MultiDock view. If the V‑Vocal interface of the clip you want to edit is not open, right-click the V‑Vocal Region FX clip and choose Region FX > V‑Vocal > Open Editor from the Clips pane pop-up menu. You can also double-click the V‑Vocal Region FX clip. Use standard editing commands (nudge, drag-and-drop, slip-edit, etc.) to move, edit, or copy the clip. Note: Offline processing commands such as Process > Apply Effect > Normalize and Process > Apply Effect > Gain do not work on a V‑Vocal Region FX clip. Right-click the V‑Vocal Region FX clip and choose Region FX > V‑Vocal > Bypass Region FX from the Clips pane pop-up menu. When you bypass a V‑Vocal Region FX clip, you hear the original audio data that makes up the V‑Vocal Region FX clip without hearing any V‑Vocal processing. When Bypass Region FX is enabled, the Bypass button in the V‑Vocal interface appears red. Right-click a Region FX clip and choose Region FX > Bypass All Region FX from the Clips pane pop-up menu. 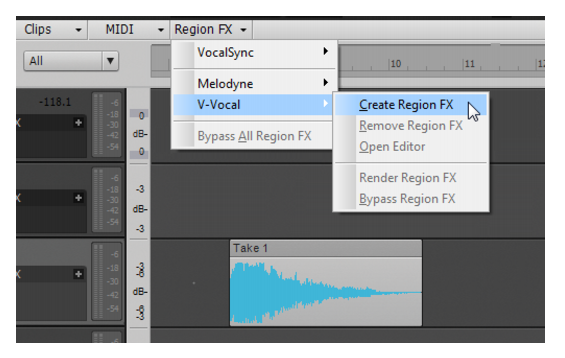 Select a V‑Vocal Region FX clip and use the Edit > Delete command, or press DELETE on your keyboard. Note: V‑Vocal commands can also be accessed by clicking the Region FX icon in the V‑Vocal Region FX clip .